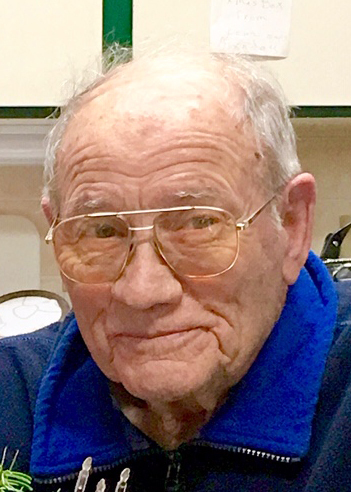 Gene Ray Phelps, 91, of Tipton, died peacefully with his family by his side in his home on Monday, April 1, 2019. Visitation will be held on Saturday, April 6, 2019 from 1:00 pm to 2:30 pm with a memorial service to follow at 2:30 at Fry Funeral Home, Tipton. Burial will follow at a later date. Online condolences may be shared at www.fryfuneralhome.com. The family asks that in lieu of flowers please make a donation to the charity of your choice. Gene was born on November 8, 1927 in Linn County, Iowa. He was the son of James Oakley and Esther Margaret Sharpless Phelps. Gene graduated from Tipton High School with the Class of 1945 and enlisted in the United States Navy where he served from 1945 to 1947. On June 15, 1948 Gene was married to Delores Jeanne Williams in the Red Oak Grove Church rural Tipton. Together they raised their three children; Dennifer, Randy and Traci. Gene was involved in Agricultural Sales and was the territorial manager for Golden Sun Feeds. He was a member of the Tipton V.F.W., past member of the Tipton Moose Lodge, past 4-H Leader and Cub Scout Leader. Gene is survived by his wife, Delores Phelps of Tipton, Iowa; his children, Dennifer Kann and husband, Peter of Greensboro, GA; Randy Phelps of Tipton, IA; and Traci Ormsby and husband, Jeff of Tipton, IA; 7 grandchildren; Elisabeth Kann, Melanie Kann Loffredo and husband Jason, Zachary Phelps and wife, Jen, S. Sgt. Corey Ormsby and wife, T. Sgt, Alexa, Tucker Ormsby and fiancée, Jessica Helton, Griffin Ormsby and Cael Ormsby; and 3 great grandchildren. Gene was preceded in death by his parents, his siblings, Naomi Wehde, Max Phelps, Dale Phelps and Carrie Etta Phelps, and his aunt, Bernice Sharpless Coder.